Mouse anti Luciferase antibody (MCA2076) used for the identification of luciferase expressing cells in tumors of athymic mice by immunofluorescence. Immunostaining with anti-luciferase antibody showed extensive expression of luciferase in tumor tissues. Dynamic Near-Infrared Optical Imaging of 2-Deoxyglucose Uptake by Intracranial Glioma of Athymic Mice. Mouse anti Luciferase antibody, clone LUC-Y detects the expression of the luciferase gene of the North American firefly Photinus pyralis in cells and tissues. Recombinant luciferase expressed in E. coli. Spleen cells from immunised BALB/c were fused with cells of the SP20 myeloma cell line. MCA2076 detects a band of approximately 55 - 60 kDa with a sample of 1ug of purified luciferase from Photinus pyralis on a Western blot. Laakkonen, J.P. et al. (2009) Clathrin-independent entry of baculovirus triggers uptake of E. coli in non-phagocytic human cells. van Beusechem, V.W. et al. (2002) Efficient and selective gene transfer into primary human brain tumors by using single-chain antibody-targeted adenoviral vectors with native tropism abolished. Zhao, D. et al. (2008) Antivascular effects of combretastatin A4 phosphate in breast cancer xenograft assessed using dynamic bioluminescence imaging and confirmed by MRI. Spiotto, M.T. et al. (2010) Imaging the unfolded protein response in primary tumors reveals microenvironments with metabolic variations that predict tumor growth. Howarth, J.L. et al. (2007) Hsp40 molecules that target to the ubiquitin-proteasome system decrease inclusion formation in models of polyglutamine disease. Keravala, A. et al. (2008) Long-term transgene expression in mouse neural progenitor cells modified with phiC31 integrase. J Neurosci Methods. 173: 299-305. Zhou, H. et al. 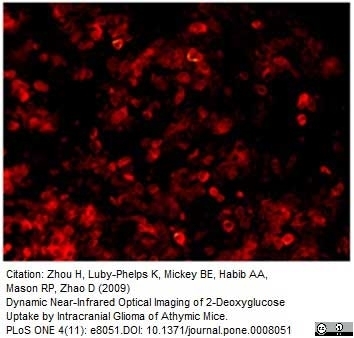 (2009) Dynamic near-infrared optical imaging of 2-deoxyglucose uptake by intracranial glioma of athymic mice.